How many islands does the Philippines have? The usual quick reply is not an answer but a question, high tide or low tide? Too many islands yet so little time, whether thinking of living an Island life in the Philippines or just travel and backpacking hopping from island to island, Tutubi will take you to an exhilarating virtual island-hopping around the Philippines' more than 7107 tropical islands-- regardless of height of the tide. The country, geographically divided into three island groups-- Luzon, Visayas and Mindano-- the largest of which is Luzon, the seat of "Imperial Manila," second largest is Mindanao and the Visayas, named after Sri Vijaya empire. Island Fortress of Corregidor, a 45 minute ride from the CCP Complex and politically part of Cavite City takes you back in time during the gloom days of World War 2 in the so called Pacific Theater where defenders of the "the Rock," led by the megalomaniacal MacArthur, delayed Japanese war timetable thereby saving Australia from the Japanese juggernaut. Potipot Island, a small island with white sand, off the beach of Candelaria, Zambales To reach the island from Manila, board a Victory Liner bus bound for Sta. Cruz then drop off at Dawal Resort. There you can negotiate for a boat to take you to the island in 15 minutes. Hundred Islands, Alaminos City, Pangasinan is a national park with more than a hundred islands, the most prominent of these are Quezon Island, Children's Island, Governor's Island, Cathedral Island and PADI Island (where cave can double as a camp site). An ambitious development plan was unveiled recently byt Alaminos City government with the aim of interconnecting some islands using underwater tubes planned by Palafox. Camara and Capones Island off the coast of Barangay Pundaquit, San Antonio, Zambales is a romantic place due to secluded white sand beaches and the romantic Faro de Punta Capones lighthouse shows the way to boats and ships out in the sea. Calaguas Island, a virgin white sand island accessible by a two-hour boat ride from Vinzons, Camarines Norte (alternately, a boat ride from Daet's Bagasbas beach or Mercedes town). Still undeveloped and touted to be as beautiful as Boracay sans the madding crowd. Palawan, the country's largest province in terms of land area, with a geography different from the rest of the islands, looks more like mainland Asia. It's home to two UNESCO world Heritage Sites: the longest navigable underground river, called St. Paul Subterranean River, and Tubbataha Reef, worthy of pride for its enviable marine biodiversity. It also sits on huge deposits of natural gas. Busuanga, Coron, Calamian Group of Islands in Northern Palawan offer magnificent wrecks of sunken Japanese ships of World War 2 (wreck diving), Coral Bay offers great snorkeling/dive site (it was here where Tutubi met clown fishes looking for Nemo) while jellyfish bay teems with jellyfishes (of course). Nearby Calauit Island is where to experience African safari in Asia due to the presence of various African animals like giraffes, zebras, impalas, waterbucks, gazelles, eland, topi and bushbacks brought to the island in 1976 by then president Marcos. Calamian Group of Islands is also the home of the endemic Calamian deer. The island of Mindoro, where the beaches of Puerto Galera (White Beach and Sabang) is most popular with Metro Manilans also boasts of popular dive sites. It's the home of Mangyan indigenous people living on the slopes of Mt.Halcon, two Mangyan tribes still use the ancient scripts similar to Baybayin (alibata). The tamaraw is also endemic to this island. Part of Mindoro off coast of Sablayan, Mindoro Occidental is Pandan Island where pristine beach awaits bold adventurers. Only one resort is located there, the North Pandan Island Resort, where a food feast awaits every visitor. By the way, there's no electricity so be prepared for a very tranquil life in paradise. Sandwiched by Tayabas bay and Sibuyan Sea is Marinduque that comes alive during Holy Week with the Moriones Festival. Romblon boasts of marble deposits while nearby Tablas and Sibuyan Islands invites backpackers to their unexplored beaches, waterfalls and caves. Virgin beaches of Carabao Island beckons intrepid explorers looking for an alternative to nearby congested Boracay Island. Some 45 minutes from Sibuyan Island is Cresta de Gallo, 5 hectare virgin island surrounded by coral reefs and fine white sand beaches. Panay, divided into four provinces of Aklan (home of Ati-atihan and the famous beaches of Boracay), Antique, Capiz and Iloilo (home of Dinagyang Festival) was said to have been the site of the legend ofthe ten datu from Borneo. Aklan's Batan town still can't shake the belief in their Code of Kalantiaw which was proven years ago to be a sham. Panay is one of the places where the rare Rafflesia, the largest flower in the world can be found. Boracay Island, the Philippines' most famous island part of Malay town in Aklan province is a the most visited and famous tourist destination in the Philippines. Negros, the boot-shaped island divided into two provinces. It used to called Buglas before Spaniards christened it Negros due to the black inhabitants of the place when the white men arrived. It's the fourth largest island of the sprawling archipelago. Cebu, the country's top retirement haven of Americans and Europeans and the playground of Japanese and Korean tourists, is home to Cebu City, dubbed the "Queen City of the South," Ce-boom economy and place full of history, beaches, waterfalls, dive sites and the heritage City of Carcar. Pescador Island, Moalboal, Cebu is the best snorkeling site Tutubi has seen so far. It's a popular dive spot centered on a small limestone formation and visible from Panagsama beach of Moalboal town in southwestern Cebu province. Bohol, the island province that enjoyed 80 years of freedom from Spanish tyranny under Dagohoy is full of tourist attractions that include Loboc River Cruise, old churches, the world famous Chocolate Hills, pristine beaches, majestic waterfalls, and the new adventure mecca of Danao. Never mind the anachronistic Sandugo Festival that commemorates, wrongfully, the blood compact, supposedly a treaty of friendship between Sikatuna and Miguel Lopez de Legazpi. It's the 10th biggest island of the country. Panglao Island, merely fifteen minutes away from Tagbilaran City, Bohol, is proud of its dive sites and beaches and is among the top tourist destination in the Philippines. A study claimed that Panglao alone has more marine diversity than the whole of Japan or Mediterranean Sea. Balicasag Island is a small island with marine sanctuary accessible by boat from Panglao Island. A government operated resort is presence as well as a lighthouse. Pamilacan Island, usually paired with Balicasag, it's a site where dolphin watching trips in the morning is the "in" thing. Siquijor Island, the mystical and enigmatic island, a ferry ride away from Dumaguete City, infamous for witches, ghouls, rituals, amulets, shamans, faith healers, and soothsayers. Where every Holy Friday is a day to recharge powers of Talisman, locally called anting-anting. The island's mysticism, most of the time, turns off tourists, but is a come-on to the adventurous few and backpackers, like Tutubi, who dislike the "usual" tourist crowd. Siquijor island is a great, off-the-beaten track destination in the Philippines, so you're missing out on this if you haven't been to the place. Please keep this a secret though until Tutubi returns there to fully explore the place. The island province of Guimaras, the home of the sweetest mangoes and once the victim of an environmental disaster in the form of an oil spill is back on its toes with steady increase of tourist arrivals. Part of Guimaras is Isla Naburot in Sinapsapan, Jordan, that takes you back to the days when there's no electricity, telephone and television for a true escape-from-civilization paradise. The captivating Island of Camiguin , Tutubi's favorite island destination due to it's rustic and laid back atmosphere, where you can find 7 volcanoes and 5 towns, hot and cold springs, white sand beaches and sandbars, majestic waterfalls and sweet vjandep pastel and lanzones/langsat. Samal Island, a short boat ride from bustling Davao City, hosts the Paradise Island beach resort with its mini-zoo, the famous Pearl Farm Resort, Crododile Farm, an interesting "Bat Cave" (where the world's highest concentration of fruit bats can be found) and the Island Garden City of Samal (IGACOS). 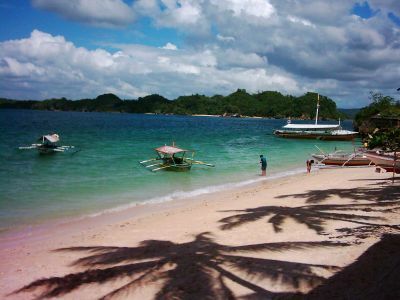 Nearby is Talicud Island and the white sand beaches of Isla Reta. Babuyan Islands, an archipelago of five major islands: Babuyan island, Calayan, Camiguin (different one from more famous Camiguin Island of Mindanao), Dalupiri, and Fuga, between the Philippines' main island of Luzon and Batanes where the only breeding ground of humpback whales in the Philippines was found. The group of islands is politically part of Cagayan province. If Corregidor is for Manila Bay, Grande Island is for Subic Bay with its bunkers and batteries guarding the mouth of the bay that's the former home of a US base. Magalawa Island, Palauig, Zambales, off the coast of Masinloc town is another not so well known gem of an island with nice white beach and fish sanctuary ideal for snorkelling. Other islands hear the area is San Salvador Island, Matalvi Island, Luan Island, Pilapir Island and Little Island. Verde Island (Isla Verde), Batalan, Caban Cove, Ligpo Island, Merriel's Rock, Sombrero Island, Bonito Island off the coast of Anilao, Batangas are popular dive spots. In a recent study conducted by marine biologists led by Kent Carpenter of the World Conservation Union, the Verde Island Passage was hailed as the "center of marine biodiversity in the world." The study put the passage at the peak of the so called "Coral Triangle" spanning an area of the Sulawesi and the Sulu Seas in the southern Philippines, Indonesia, Timor Leste, Papua New Guinea and Solomon Island. Balesin Island, an unspoilt Fantasy island in Polillo, Quezon. Four hours land travel from Manila and another three hours by boat but you'll be away from civilization while you're there. Fortune Island off Nasugbu, Batangas, is near where the San Diego galleon, exhibited at the National Museum of the Philippines in Manila, was recovered. Cagraray Island, part of Bacacay, Albay on the eastern slope of Mayon Volcano and near Sula Channel in the Bicol Region. It's home to fine white sand beach of Misibis Beachfront Resort and near the grand Misibis Resorts, Estates and Spa. Samar, the third largest island of the Philippines, is always at the receiving end of typhoon reports due to its being the easternmost part of the country to receive incoming tropical depressions. Samar, likewise, boasts of forest reserves and other natural attractions. It's in this island where the regal Philippine eagle was first "discovered" by John Whitehead. Olango Island in Cebu features a bird watching paradise where thousands of migratory birds escaping the cold winter of Russia and China seek refuge and food abundant in the area. Bantayan Island fine white sand beaches without the crowd of most popular beaches. To get there from Cebu airport, flag a taxi to take you to Cebu North Bus Terminal, board a bus bound to Hagnaya. In Hagnaya, board a ferry for a 30-minute ride to Sta. Fe town on Bantayan Island. Near Bantayan is Malapascua Island that caters to diving enthusiasts and a short boat ride from Daang-Bantayan town in Cebu Island or directly from Bantayan Island. Camotes Islands, named after sweet potatoes, part of Cebu province and located between Cebu, Leyte and Bohol islands, consist of four islands, Pacijan Island, Poro Island, Ponson Island and the small Tulang Island. Virgin beaches await the intrepid explorer to these tiny island paradise devoid of people. Sumilon Island, an island, whose name means "to take shelter," off the coast of Oslob a southern town in cebu. It offers spectacular diving experience once ravaged by Muro Ami fishing methods but now brought back to life. Lakawan Island, a mere hour away from Bacolod City, means "puntahan" in Filipino, is an island getaway for tired souls of the city of smiles. Danjugan Island in Barangay Bulata, Cauayan, Negros Occidental is showcase of Philippine Reef and Rainforest Conservation Foundation Inc. (PRRCFI) for its ecosystem and wildlife conservation. Apo Island, politically part of Dauin, Negros Oriental and accessible by boat from Dumaguete City, is a popular dive site and snorkeling destination for tourists boasting of an impressive list of fish and coral species. Nogas Island, 3 miles from the shore of Anini-y town of Antique and a government naval reservation. Leyte, immortalized during the second world war where the surrounding played silent witness to a great naval battle in history. San Pedro Island off Hinunangan in South Leyte offers secluded white sand beaches. Siargao Island, Surigao del Norte, in the north-eastern tip of Mindanao is a world-class surfing destination famed for its "cloud 9" waves. Off the coast of the city of Mati, Davao Oriental lie the islands of Waniban and Pujada with their white sand beaches ideal for backpackers. Waniban Island is a 15 minute boat ride from Cinco Masau Resort where you can rent a banca going to the island. Internationally disputed Spratly Islands, called Kalayaan, lies within Philippine area of responsibility yet claimed by neighboring countries that include China, Taiwan, Vietnam is said to have huge deposits of gas and oil besides straddling a vital sea lane in the region. Sta. 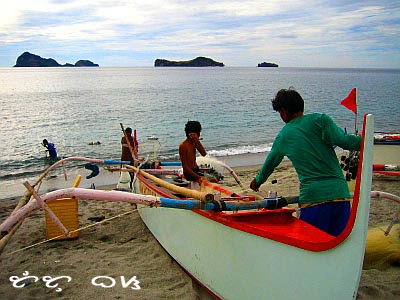 Cruz Island, fifteen minute by boat from the pier of Zamboanga City boasts of a rare pink sand beach. In order to go there, you need to coordinate with Zamboanga Tourism office near Lantaka Hotel for booking, and security escorts since it's too proximate to Basilan Island. Basilan Island, an island province notorious as haven of terrorists, has the potential for tourism destination if not for the "sword of Damocles" perpetually hanging over intrepid visitors. Secluded beaches and lush jungles create a perfect mix for eco-tourism in the area-- if the present conflict is resolved! Sulu, a site of the regular Balikatan (shoulder to shoulder) military exercise by the US ironically is also the site of the Bud Dahu massacre of about 600 Tausug men and women, including children, were killed by US soldiers in 1906. It's also in Sulu and nearby islands where the langgal, a local meeting place and mosque featured in the P1000 bill, can be found. Tawi-tawi, the southernmost province of the Philippines, part of the Autonomous Region in Muslim Mindanao (ARMM) with capital town of Bongao. It shares sea borders with the Malaysian State of Sabah and the Indonesian Kalimantan province. Turtle Islands, part of Tawi-tawi province is geographically close to Malaysia's Sabah state in the island of Borneo. It boasts of a turtle sanctuary where you can find the only living area of Green Sea Turtles (pawikan) in the world. Declared a protected area, it's also a site of international turtle protection and conservation program. 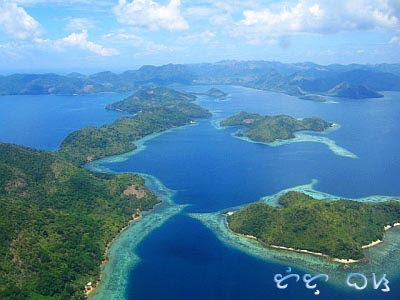 Besides these Philippine Islands, Tutubi was able to set foot on the Island of Singapore, Hong Kong Island, Lantau Island, Elephanta Island off the coast of Mumbai India and wishes to be able to visit Palau, Easter Island, Christmas Island, Galapagos, Komodo Island in Indonesia to see the Komodo Dragon and lots of islands more. What can you do in these islands? lots of activities: snorkel, beach bum, surf, windsurf, jet ski, dive, parasail, kiteboard, kitesurf, yatch race, even join the annual Philippine Hobie Challenge, Paraw Regatta (Iloilo), dragon boat races and other water sports activities. Tutubi dreams of living on a small island, away from it all where life begins and ends with the sun while days pass by lazily slumped on a hammock...but life's not a beach! Consummatum Est. Finished his virtual island-hopping. Question: How many islands have you been to? waaah!!! still a lot of places to go to. waaah i've only been to boracay and a chance to go to bohol loboc at the end of the month!!! you forgot catanduanes!!! commonly known as the first target of typhoons, this island north of the bicol peninsula is about 4 hours away by ferry from tabaco, albay. i remember going to a beach with gold-colored sand. i think there are more beaches, with some good for surfing. have already visited at least 15 islands... all very nice so have been to those islands at least twice... will surely explore more islands... maganda talaga ang pilipinas!!! lilyofthevalley, thanks for the visit. maganda talaga pinas. can you send me your blog link so i can return the visit? tutubi : multiply? hmm.. that wasnt me.. i dont have any accoaunt there! you know, i long wanted to write/blog but get so lazy and work gets on my way... may be just multiply and instead of writing just post pictures of the places i have been... hmm... i think thats a nice idea... i will check your new entries later... thank you ha..
dang! i have to include this in my list soon. island hoping pinas must be fun and exciting! how to get to nogas island? any contact person? it need not to visit them all i already do it!!!!!!!!!!!! This is a nice outline of the Philippine islands! I for one am planning to visit Palau soon. Any thoughts on that? Too many island. Siargao Island is interesting. How do I get there if I'll stay in Davao City? Hi Tutubi ~ perhaps you can help us find a way to visit Calauit Safari DIY style.It's too expensive when this tour is included in the tour packages. Please help us! Thanks!! !